PRESS RELEASE: Roland is proud to introduce the V-Drums® V-Compact® Series TD-4SX, the companion kit to the popular TD-4S, and Roland's most affordable all mesh head V-Drums kit to date. 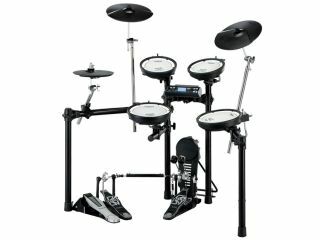 The versatile TD-4SX electronic drum set features Roland's patented multi-layer mesh heads for the snare and toms, providing the incredibly dynamic feel for which Roland V-Drums are famous. With new 6.5" PDX-6 mesh pads for the high-toms and 8" PDX-8 mesh pads for the snare and floor tom, the TD-4SX provides a natural feel and expressiveness for performance or practice. It is also expandable with an optional V-Pad or V-Cymbal Ride/Crash. The TD-4SX is scheduled to be available in September 2009.